Every once in a while this little ol’ podcast reels in a very BIG guest and this one is no exception. In this Near Minterview special, we talk one-on-one with the eisner-nominated artist of Detective Comics, J.H. Williams III. Fresh off his phenomenal run with writer, Greg Rucka, J.H. is poised to take Kate Kane, Batwoman, from the pages of Detective and into her own monthly ongoing which he will write and draw in collaboration with W. Haden Blackman (Star Wars: Purge) and Amy Reeder Hadley (Madame Xanadu). During our conversation we talk about JHW3’s career in comics, his unique melting pot approach to art and storytelling, and his ability to push conventions and expand the language of comics. 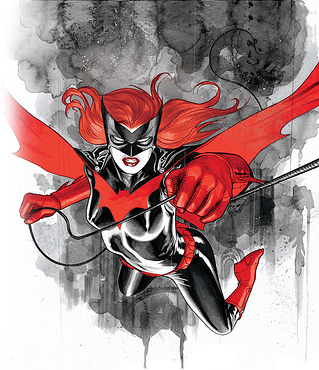 In the second half of the episode, we cover all things Batwoman as J.H. takes us behind the scenes of the on-again-off-again Bat-title and how it finally got the green light. 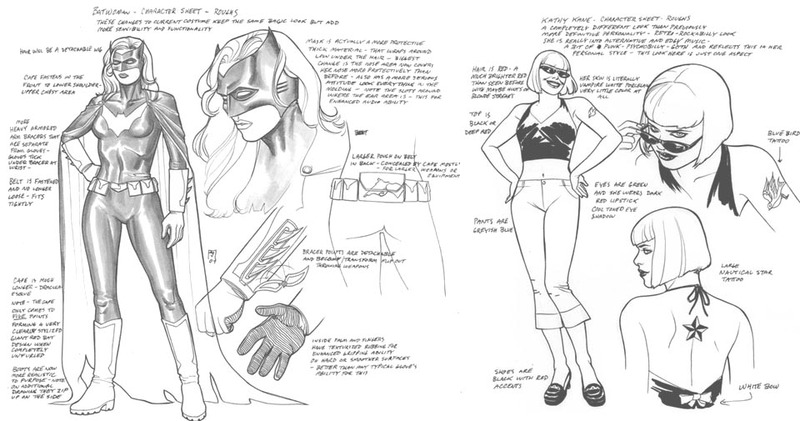 We discuss Kate Kane’s character, her costume, her sexuality, her place in the greater DCU and what we can expect to see in her upcoming adventures. Josh’s long-awited date with destiny is finally here. In this much-anticipated episode, Josh takes on Ben’s dad, Tim Peirce, in Watchmen Jeopardy! 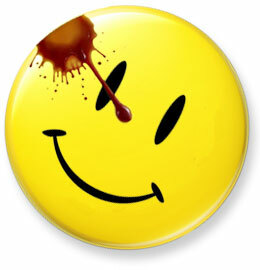 Ben plays host and Greg Giorgio joins the show for raucous round of trivia covering all aspects of Watchmen. Who will win? Who will lose? What is the difference between a blimp and a zeppelin? Listen to find out all this and Moore! Near Mint Madness – SPIDEY vs. BATS in the FINALS! We’ve reached the finals of the 2010 Near Mint Madness Totally Arbitrary Bracket Tourney.Five rounds and 64 competitors have led us to this moment. Two characters, two companies, one champion. 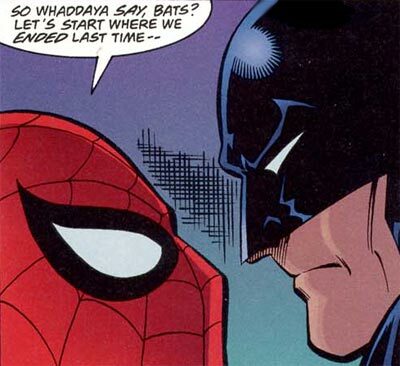 On one side, Batman – the Dark Knight Detective won against Wolverine, the power of flight, manga and Star Wars before finally defeating Marvel Comics in the Final Four. 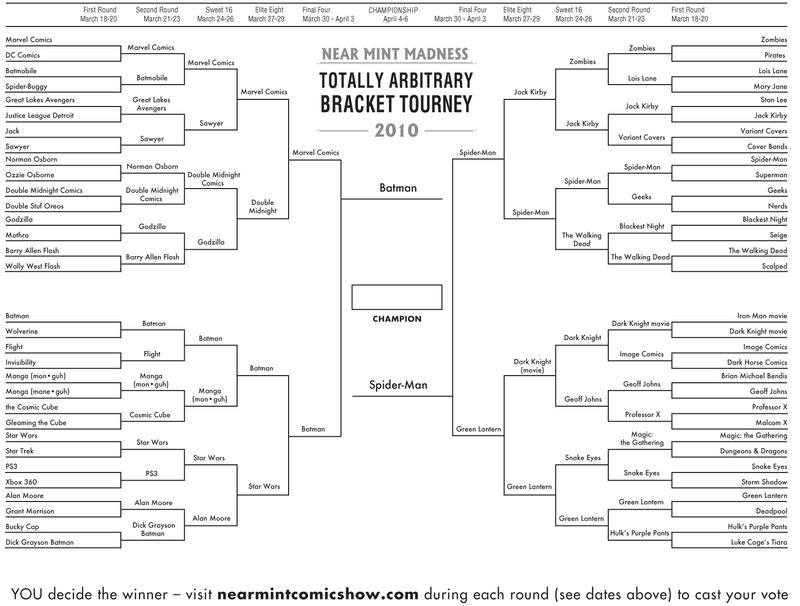 Well, Bats may have bested Marvel, but now he Faces their greatest Champion, Spider-Man – Spidey wall-crawled his way past Superman, geeks, The Walking Dead and Jack “the king” Kirby before narrowly defeating Green Lantern in the Final Four and punching his ticket for the finals. Now it’s up to you! YOU DECIDE THE WINNER – VOTE NOW!